Everyone is well aware by now of the brief brawl between the Manny Pacquiao and Brandon Rios camps Wednesday morning in Macau, China, where the two fighters will meet Saturday in the welterweight main event (on HBO pay-per-view). But even a day earlier, Robert Garcia was making a bold statement regarding Pacquiao’s apparent bleak future as a fighter. Garcia trains Rios. An argument over gym time turned physical when Alex Ariza kicked Freddie Roach in the chest on Wednesday morning at a gym in Macau, China. That’s where Manny Pacquiao and Brandon Rios will square off Saturday in the welterweight main event at the Venetian Resort (on HBO pay-per-view). 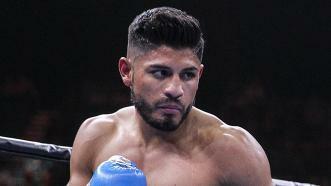 Roach trains Pacquiao, Robert Garcia trains Rios. As for Ariza, he used to be the strength and conditioning coach for Pacquiao, but now has that role in the Rios camp. A video shows Roach and Garcia arguing over Team Rios still being in the gym at 11 a.m. (Macau time) even though Pacquiao’s time starts at 11. As the two exchange barbs, a member of Rios’ camp is beside himself and has to be restrained and Ariza and Roach begin to jaw at each other. Roach took a step toward Ariza, who then kicked Roach in the chest. Roach told security he wanted Ariza arrested. There is a video out there that can be found on YouTube. We can’t post it here because it contains quite a bit of foul language. Featherweight world champion Mikey Garcia of Oxnard will play host to a sparring session today at 11 a.m. at the UFC Gym in Yorba Linda. It will be open to the public. Garcia (31-0, 26 KOs) is preparing to defend his title against former champion Juan Manuel Lopez (33-2, 30 KOs) of Puerto Rico on June 15 at American Airlines Center in Dallas (on HBO). Joining Garcia at the workout will be his older brother and trainer, former super featherweight champion Robert Garcia. Also on hand will be their father, Eduardo Garcia, who helps Robert train Mikey. When Josesito Lopez of Riverside and Marcos Maidana of Argentina square off in the welterweight main event June 8 at Home Depot Center (on Showtime), it will also be a clash between their respective trainers – Henry Ramirez and Robert Garcia. The two are friends, but these guys are pros and they’d never let that stand in the way of a fight that has the potential to be terrific. Lopez is 30-5 with 18 knockouts. Maidana is 33-3 with 30 knockouts.